Marguerite Bennett arrived on the comics scene last year with some interesting one-shots and one-shot stories in ongoing series. Her writing has been a mixed bag for me, but I won’t deny either that it is good to have completely new blood in the industry. Her stories have been interesting, even if they haven’t been executed all that well. With this particular one-shot, I was very excited about it, but that expectation hasn’t held up sadly, because I just could not get interested in this story here. This story here is one that is told from multiple viewpoints and multiple moments from Lois’ life. We see her as she is in the present, and when she and her sister Lucy were kids growing up on army bases across the world. We see Lucy as she is in the present, with the life that she has made for herself, and what happens to her that sets off the entire story. It is all quite an interesting framework, but it wasn’t interesting enough to make me go “wow, this is really good”. It was all just a tad too boring for my tastes. It was nice and all to get to see Lois and Lucy’s history as kids, since that isn’t something that is usually shown in the comics, and it made for a nice change of pace from the other narrative which had Lois being all reporter and all, but like I said, the execution just wasn’t there to the level that I expected it to be. And the monologue text boxes were a part of that. They felt formal and forced, and they made the narration feel like a chore rather than something that draws you in. And too much exposition too. This was an oversized issue and thus there is already a lot of dialogue here. On top of that we had all the expository narration, and this issue was weighed down by all of that. Another thing I didn’t like was that this one-shot is titled Superman: Lois Lane #1. For one, the story here had absolutely nothing to do with Superman. Second, he only shows up for a panel, and is referenced indirectly (like) three times in all in the final few pages. Third, Lois Lane is every bit as big a character as Superman and she doesn’t need that title. It is like putting out a Nightwing one-shot and calling it Batman: Nightwing. Doesn’t really make sense. Its a publicity/marketing issue and not a writing issue, just to be clear, and so the fault lies with the company’s bigwigs rather than with Marguerite. On the art side, we had four pencillers here: Emanuela Lupacchino, Mehan Hetrick, Ig Guara, and Diogenes Neves. Guillermo Ortego, Hetrick, Ruy Jose and Marc Deering did the inks. Hi-Fi did the colours, and John J. Hill did the letters with Kenneth Rocafort doing the cover. First of all, I didn’t like the artwork at all. While somewhat representative of the content inside, its really not a good cover in its composition. Rocafort has done some great work before, but this is not it, not by a good shot. And I fail to see just why this issue need four pencillers and four inkers. It is an overload. The transitions are often glaring, and the continuity of the art suffers as well. The colours are good though, so that’s something. Overall, I expected this to be much better than it was, and that’s all that I can really say in the end. Still, I wouldn’t mind an ongoing written by Marguerite. I would welcome it in fact because despite the missteps here, I think this is still a decent proof of concept for a Lois ongoing. Sales numbers will tell though. 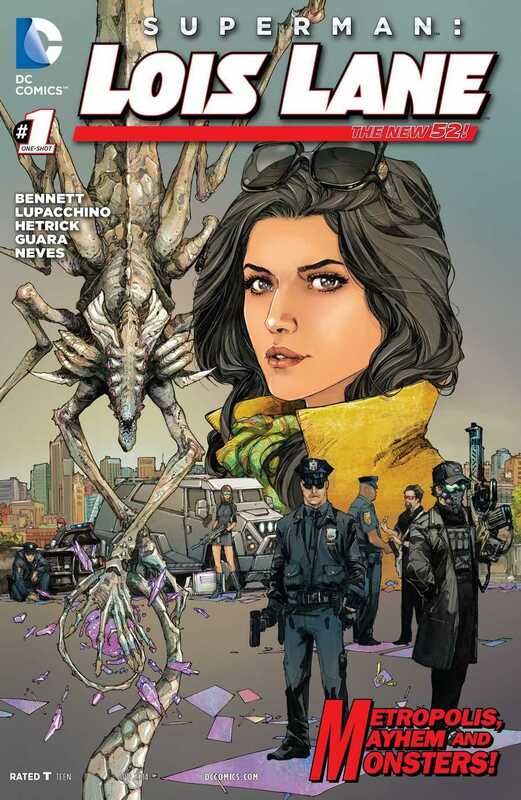 Posted on March 2, 2014, in Comics Reviews, Review Central and tagged Aliens, Comics, Comics Review, DC Comics, General Sam Lane, Lois Lane, Lucy Lane, Marguerite Bennett, Metamorphosis, One-Shot, Reporter, Review, Review Central, Shapeshifting, Superman: Lois Lane. Bookmark the permalink. Leave a comment.